Hendre Self-cateringHendre is situated in its own private secluded grounds, tucked away off the beaten track and is ideal for a peaceful "get away from its all" holiday. A place of calm tranquility and meditation with only the sound of the River Dwyfach, accross the field, making its way down to the sea. Hendre is reached along half a mile, of a winding leafy lane, filled with daffodills, primroses and bluebells in spring, followed by interesting flora and fauna throughout the year. The farmhouse has been lovingly restored using original stone and slate and retaining the large inglenook fireplace, some thick stone walls, deepset windows and an old beamed ceiling. Now the farmhouse provides spacious, stylish and comfortable self-catering accommodation. Accommodation - 3 bedrooms, sleeping 6 plus cot (+ 2 with extra folding beds by request). All bed linen provided with beds made up ready for arrival. Main Bedroom with antique 'Half Tester' Mahogany Bed with en-suite Bathroom with whirlpool bath, two washbasins and toilet. Second Bedroom with two full sized Single Beds, pine bedside chests, a pine chest of drawers and built-in wardrobe. Third Bedroom with 4'6" Double Bed with en-suite Shower Room with Double Shower, fitted units with basin and toilet. 3 Stone steps down to Hallway and Stairs. At the end of the hallway there is a Shower Room with NORDIC Sauna. Utility Room with toilet, basin, washer /dryer, iron and ironing board, freezer, and combi boiler. Grounds: Patio with garden furniture and barbecue. Rotary Clothes line. Two good sized lawned areas with shrubs, one being a terrace with a Gazebo, providing an ideal place for al fresco meals or just to sit out watching the buzzards wheeling overhead or listening to the tapping of woodpeckers in nearby trees. Ample Parking and safe cycle storage. 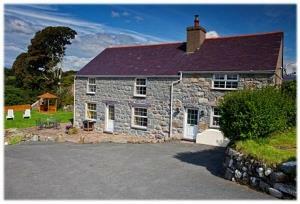 Hendre is situated in its own private secluded grounds, tucked away off the beaten track and is ideal for a peaceful "get away from its all" holiday. A place of calm tranquility and meditation with only the sound of the River Dwyfach, accross the field, making its way down to the sea. Hendre is reached along half a mile, of a winding leafy lane, filled with daffodills, primroses and bluebells in spring, followed by interesting flora and fauna throughout the year. Electricity and oil fired central heating througout and included in rent. Starter basket of logs for stove supplied, then after at cost. Head onto the A487 towards Porthmadog. Half a mile past Brincir village (just past "The Goat Inn" (on the left)) turn right (signposted Criccieth, B4411) After one mile turn right onto a single track road, signposted "Ynys". Use the provided map to find the cottage you require. Turn onto the B4411 (in the center of Criccieth) After 3 miles turn left onto a single track road, signposted "Ynys". Use the provided map to find the cottage you require.